iPhone-using manga-enthusiasts, rejoice! For now, there exists an app that syncs with onemanga.com–a site that any otaku worth their salt has bookmarked–to bring you the latest in scanlated/scanned Japanese graphic novels. All it takes is one download (or if you want the full experience, two) and an Internet connection. Upon launch, the Catalog tab (first on the toolbar) will be filled with most of what is found on onemanga.com in alphabetical order (the default). The Search bar is right up at the top, or you can jump through the alphabet by scrolling down the list o’ letters on the right side. The list can also be sorted by Rank (presumably the ones most downloaded go on top) and by those most recently updated. Tapping on a title will take you to its detailed profile: mangaka, release status, listing of chapters, etc. Tapping on the “i” button will take you to a synopsis, while you can also Favorite the title (doing so will notify you of updates) or tell your friends via Facebook or email if you find a particularly interesting title. Tapping on a chapter will bring you to the actual content, as well as downloading the chapter onto the app for future reading; this is where it gets tricky, because depending on whether or not you’ve made the $1.99 in-app purchase, your reading and downloading can be a tad different. Without the purchase, you have to manually select the chapter in order to add it to the download queue, and the skimming option is not available to you. If you do make the leap, you can choose as many chapters to download at once (hurray for “Select All” functions) and can now Skim the pages, which involves a view much like the Cover Flow option in iTunes. You can also cancel downloads from the Downloads section, and read while you’re downloading. Downloaded content is available for viewing any time, whether you have Internet or not. There is a total of 899 mangas on the list, and you’re bound to juggle a good portion of that in your manga-devouring endeavors. Luckily for us, Manga Rock remembers what page of a chapter we were on last, and the Recent tab displays your reading history. Once you’re settled into reading, you can lock the pages into portrait or landscape position, swipe your finger left and right to flip pages (turn off the flipping noise in the Info tab if it bothers you), and pinch-zoom/double tap to zoom or unzoom. The page viewer is a thing of beauty, simple yet effective–it’s actually sort of reminiscent of how the iBook app works on the iPad. In fact, Manga Rock would be ridiculously awesome on the iPad (once the developers release that version), because the iPhone/iPod Touch screen is just too tiny for an extended reading jaunt with my overly tired peepers. Other options I’d like to see added to Manga Rock are more search filters and the ability to disable auto-lock. onemanga.com allows searches by categories, which is what I’m most interested in, as I’m not interested in going through every title in a quest for, say, a josei manga–even better would be multi-filter searches, such as completed comedies. Disabling the auto-lock would be helpful if I just wanted to leave the device to mass-download an entire series. An extra neat trick would be to break the page view down to a frame-by-frame basis, so you can use arrows to “scroll” through. Be forewarned that not all titles on onemanga.com can be found in the Manga Rock app, due to legal issues or “graphical nature.” This means a lot of the flagship titles (i.e. Bleach, Naruto, Inuyasha) aren’t available; indeed, many a tear has been shed because Kuroshitsuji has just recently been taken down. But as freeloading otakus, we should be used to this…and hey, there are still nearly 900 titles to choose from, so expand your horizons if you’ve only been reading those big names. Manga Rock is a fantastically superb resource for any manga reader (especially true for iPad owners), even the free version. Heavy users might want to consider investing in the in-app purchase, so it’d be most helpful if the developers outlined exactly what users would be getting with the purchase in the description; as it is, without the promotional announcement at the top (which should be gone after this weekend), it sounds like one would be getting the full deal with just the free download. 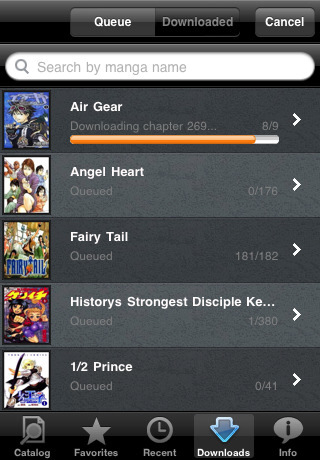 AppSafari review of Manga Rock was written by Julie Guan on May 11th, 2010 and categorized under App Store, Art, Books, Featured, Free, Fun. Page viewed 5545 times, 1 so far today. Need help on using these apps? Please read the Help Page.